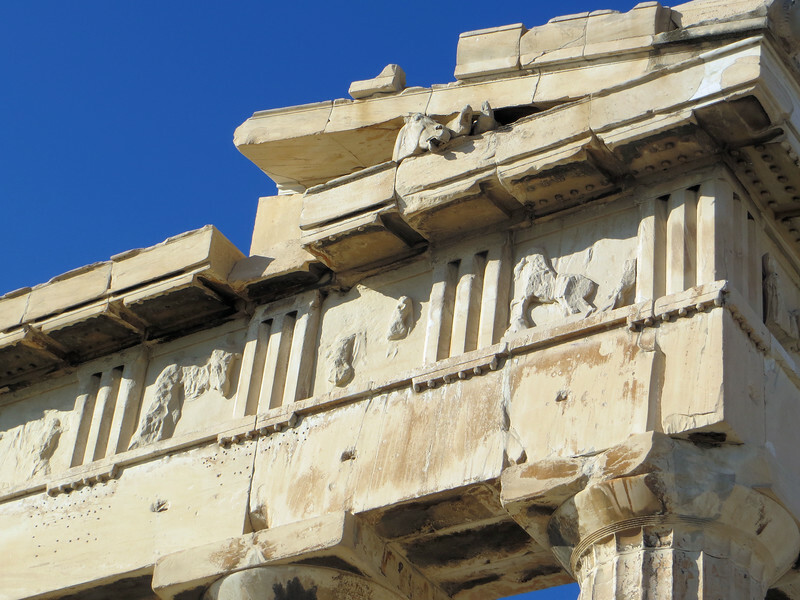 One of the most spectacular features of the Parthenon was its ornamentation. That consisted of 3 types. The pediments (the triangular parts atop the east and west fronts) depicted parts of Athena's life story. Below the pediments, as you can see here, were rectangular panels called metopes, showing scenes from mythic battles. There were originally 92 of them, mostly designed by the renowned sculptor Pheidias. Inside the outer temple was an inner room called the cella. Around the columns of this room was a 525 long frieze that circled the building. It showed an elaborate procession with more than 600 participants--men, women, musicians, sacrificial animals. Scholars don't all agree on what kind of procession it was. Some believe it to be the Panathenaic parade that was held every four years. All of this would have been brightly painted.